Another Pink Paislee project to share today – this time using the Hometown Summer Collection. At the end of this post I have also announced the winner of my Echo Park giveaway. This bright and fun collection was perfect for decorating these Mini Drawers from Kaisercraft. I have used the printed tissue from the Pink Paislee Daily Junque Collection to cover the sides and edges of the project before covering the top and sides with patterned paper from the collection. This was easily done by cutting the tissue to size and using mod-podge to stick it to the mdf project. The baubles make wonderful handles for the drawers and small elements cut from the borders stickers make these great little flags on which to mount them. 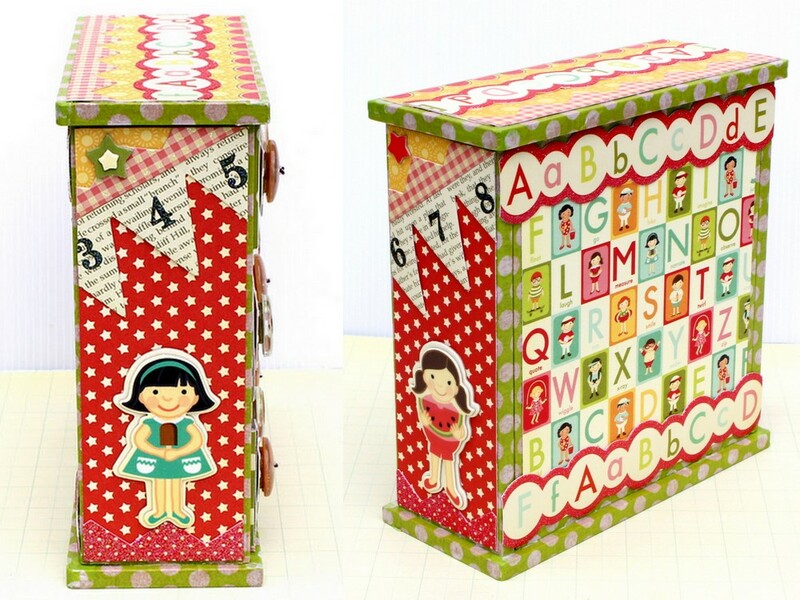 These gorgeous little girls from the chipboard pops add such a fun feel to the sides of the drawers and even the back of the project gets a fun and funky feel with this alphabet printed paper from the 6×6 paper pack. Hopefully my sister doesn’t see this post before Christmas as I am going to give her these for her little daughter! Congratulations to Jamie from http://oohlalapaperie.blogspot.com/ who wins the Season’s Greetings and Times and Seasons paper pads! Jamie – wherever you are – please email me through the Contact page on my blog with all your mailing details! PaperVine Blog Launch – Win Some Goodies! Exciting News & Teresa Collins Boxes! I am IN LOVE with this!!!!!!!! This is FABULOUS! As usual I LOVE IT!! I love it, it's amazing!!! Super cute! Your niece is going to love this!! I just love that paper line. This project is adorable! Wow this is gorgeous! Beautiful job! This is beautiful! I love how colorful it is! The little girl in me screams in excitement over this little organizer! Love this! I'd love to have you link up if you get a chance at http://scrapbookingez.blogspot.com/2011/12/anything-goes-linky-party_22.html. Thanks for sharing! This is just darling and so cheerful!